The Bible mentions unicorns. Israelites are identified by a lion and a unicorn such as appears on the British coat of arms. The Scottish coat of arms depicts two unicorns. An analysis of Biblical passages, archaeological findings, Rabbinical and other sources, indicates that there once was a one-horned creature who gave rise to our image of the unicorn. 1. How can the unicorn stand both for Manasseh and for the Ten Tribes in general? 2. The Biblical Source for the Tribal Symbols. 3. Each Tribal Group of Three ALSO had its Own Sign! 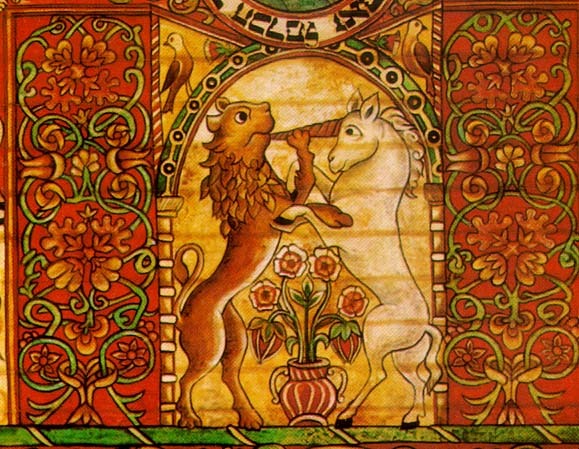 At the beginning of the YouTube Clip "Time-Line: The Sons of Israel"
The unicorn (you say) represents Joseph and the Ten Tribes whereas the Lion is Judah. The lion is kissing the horn of the unicorn symbolizing the eventual reconciliation between the Jews and the Ten Tribes as explained in Ezekiel 37. [The picture in question is taken from a reconstruction now on display at Beth Hatefutsoth, the Museum of the Jewish Diaspora in Tel Aviv. # The lion and the unicorn, painted opposite the bear and framed in a similar way, represent forces of great strength which reach a certain balance, thus making it possible for the forces of life and redemption to grow in them. These forces are symbolized by the Tree of Life. It is hard to tell whether the two animals, which possess supernatural strength, are embracing one another or wrestling. # The large, strong horn appears stuck in the lion's mouth, an image which calls to mind the blowing of the ram's horn. The blast of the horn is suggestive of victory, kingship and the coming of the Messiah. Ida was apparently was not aware of the pertinence of this picture to Ten Tribes lore in Jewish tradition. Alternately Ida did know of this but sought to reformulate the symbolism is terms of a more universalistic approach. Nevertheless, her interpretation may be seen as supplementing rather than contradicting our own. Elsewhere you state that the unicorn was the symbol of Manasseh whereas the bull or bull-calf represented Ephraim. How can the unicorn stand both for Manasseh and for the Ten Tribes in general? The symbols are based mainly on a Midrash (quoted in full below) concerning the encampment around the Tabernacle. The Bible mentions the fact that each Tribe had its own symbolic emblem. 2 The Israelites shall camp each in their respective regiments [Standard], under ensigns by their ancestral houses; they shall camp facing the tent of meeting on every side. The expression translated as "each in their respective regiments" in Hebrew is "al digloy" i.e. according to his flag (or standard). The words "under ensigns" in Hebrew is "be-Otot" i.e. by symbols. Each flag bore a particular symbolic picture. A suitable symbol. that the tribe is recognized by. According to what is said in Midrash Rabah on this passage, the flag of each tribe was the same color as that of their stone in the Breast-Plate [of the High Priest]; in addition there was a symbol characterizing each tribe. The Midrash tells us that each tribe had its own particular symbol. Each Tribe had its own standard. The Midrash says that the other nations learnt to use distinctive standards from the Israelites. 17...they shall set out just as they camp, each in position, by their regiments. The word translated as "by their regiments" in Hebrew is "lediglayhem" i.e. By their flags. Each Tribe had its own standard or flag. Numbers 2:3... the flag of Judah... the flag of Judah.... (2:10)... the flag of Reuben... etc. The Tribes were assembled around the Tabernacle in groups of three. Each group is named "machaneh" i.e. camp. Four camps of 3 each gives us 12 tribes. Ephraim and Manasseh were the tribes of Joseph but each was counted as a separated tribe. The Tribe of Levi was in the center and surrounded the Tabernacle from all 4 sides. This gives us 13 Tribes. The camps of Three were each named after the leading Tribe in the group. The Camp of Judah in the east (Numbers 2:3) consisted of Judah, Issachar, and Zebulon. The Camp of Reuben in the south (Numbers 2:10) consisted of Reuben, Simeon, and Gad. The Camp of Ephraim was in the west (Numbers 2:18). It consisted of Ephraim, Manasseh, and Benjamin. The Camp of Dan was in the north (Numbers 2:25). It encompassed Dan, Asher, and Naphtali. The Camp of Reuben was represented by the figure of a man. This was associated with the mandrakes that Reuben (Genesis 30:14) had brought to Lead his mother. The mandrakes apparently were a plant whose roots resembled a male figure. The Camp of Judah was a lion. The Camp of Ephraim was a bull. The Camp of Dan was a "nesher" which may be translated to mean either an eagle or a vulture. These four signs parallel the faces of the Cherubim in the vision of Ezekiel. Ezekiel 1:10 As for the appearance of their faces: the four had the face of a human being, the face of a lion on the right side, the face of an ox on the left side, and the face of an eagle. Joseph did not have his own marching group but was represented by his two sons, Ephraim and Manasseh. The symbol of Joseph i.e. of Ephraim and Manasseh together, according to the Midrash was a picture representing Egypt, probably a pyramid, cf. the Great Seal of the USA. Joseph is also often represented by a sheaf of wheat. Manasseh and Ephraim are the sons of Joseph so the symbols of either in specific contexts can represent Joseph as well. In the picture you are referring to the Unicorn represents Joseph and the Lost Ten Tribes in general. The word we translated as unicorn in Hebrew is RAEM. Sometimes this is translated as a wild bull or ox. There was a type of gigantic wild bovine known to the Assyrians as a rimu (or sakaea) and to the modern world as the auroch. Such beasts were still extant in Europe in the 1600s. It seems that a mutant branch of the auroch family would frequently generate specimens with only one horn, as deer sometimes do. This was one of the sources that gave rise to traditions concerning the unicorn. The unicorn is represented as a horse with one horn whereas the auroch belonged to the cattle family. This type of auroch however appears to have been slimmer and taller in the shoulder than the others, like some deer and horses are. When the species became extinct it was therefore depicted from memory more like a horse as indeed in profile form it resembled. In the Prophecy of Balaam concerning Israel in the End Times a lion and unicorn are mentioned. He has strength like a wild ox [RAEM i.e. unicorn]. This prophecy of Balaam may be referring to all Israel or to Israel as represented by the forces of Joseph. We identify Manasseh with the USA though the emblem of the UK is the one that depicts both a lion and a unicorn. We may sum up by saying that the lion and unicorn together represent the forces of all Israel with an especial emphasis on Judah and Joseph. Midrash Numbers Rabah: BaMidbar 2;7: ensign: Each Tribe had its own sign and color on its standard. The color was the same as that of the Tribe's precious stone [on the Ephod on the heart of Aaron]. Reuben had the Odem stone [in Hebrew "Odem" means red] and his flag was red. Dudaim [mandrakes] were depicted on it. Shimeon had the Pitda stone, his flag was colored green and depicted the city of Schechem. Levi had the bareket stone and his flag was one third white, one third black, one third red. The Urim and Tummin were depicted on it. Judah had the Nophech stone, the color of his flag was like the sky. It depicted a lion. Issachar had the sapir stone, it depicted the sun and moon, as it says "AND OF THE CHILDREN OF ISSACHAR, WHICH WERE MEN THAT HAD UNDERSTANDING OF THE TIMES" [1-Chronicles 12:32]. Zebulon had the Yeholam [diamond] stone. His flag was whitish and a ship was depicted on it as it says, "Zebulon shall dwell on the beaches of the sea" (Genesis 49;13). Dan had the Leshem stone, The color of his flag was like a sapphire and it depicted a snake as it says Dan shall be a snake by the wayside (Genesis 49:17). Gad had the Shevo stone. The color of his flag was not white and not black but mixed black and white. It depicted an encampment, as it says GAD SHALL BE A TROOP: BUT HE SHALL OVERCOME AT THE LAST. Naphtali had the Achlama stone. The color of his flag was like clear wine, reddish but not strongly so. A hind was depicted on it, as it says NAPHTALI IS A HIND LET LOOSE: HE GIVETH GOODLY WORDS [GENESIS 49:21]. OUT OF ASHER HIS BREAD SHALL BE FAT, AND HE SHALL YIELD ROYAL DAINTIES [GENESIS 49:20]. Joseph had the Shoham stone. The color of his flag was the deepest black. On the flag of Joseph for the two princes of Ephraim and Manasseh was depicted a representation of Egypt since their origins were in Egypt. On the flag of Ephraim was depicted a bull: "HIS GLORY IS LIKE THE FIRSTLING OF HIS BULLOCK" [DEUTERONOMY 33:17]. This was exemplified by Joshua who was from the Tribe of Ephraim. AND HIS HORNS ARE LIKE THE HORNS OF UNICORNS [DEUTERONOMY 33:17]. This was exemplified by Gideon who was from Menasseh. Benjamin had the Yaspa stone. The color of his flag was like all the 12 colors. A wolf was depicted on it: [GENESIS 49:27] BENJAMIN SHALL RAVIN AS A WOLF: IN THE MORNING HE SHALL DEVOUR THE PREY, AND AT NIGHT HE SHALL DIVIDE THE SPOIL.